Your basement has a lot of potential once you look past the concrete floors and bare drywall. 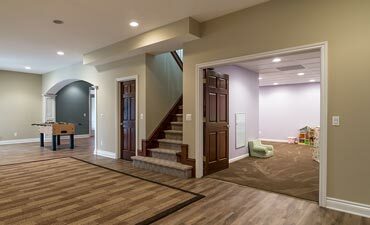 Fortunately, our basement finishing contractors in Oakland County, Michigan can help you transform your basement into usable living space. As a finished basement company, we understand that basement remodeling is an investment in your home. For this reason, we want to make sure you know the steps to finishing a basement. Keep in mind that your basement remodeling project may be different depending on what’s already been done, local building codes, and whether you plan on having bedrooms. For example, you’ll need to have emergency egress in each sleeping area. Determine if basement waterproofing is needed. Hire one of our basement finishing contractors. Enjoy your new finished basement! Remove all boxes, Christmas decorations, old furniture, and anything else that’s in your basement. Our basement remodeling contractors will need full access to your basement in order to finish the walls, floor, and ceiling. Removing all your personal belongings will also ensure they stay safe and clean during basement finishing. Does your basement smell damp? Does the backyard slope toward the house? If so, you’ll want to have your basement inspected to see if waterproofing is needed. Even if you think there’s no chance of your basement flooding, we still highly recommend having this double-checked by a professional. The last thing you want (or need) is to spend thousands of dollars on basement finishing only to have your new space flood the next month. Basement waterproofing will help keep moisture out of your basement so you don’t have to worry the next time it rains. An ounce of prevention is worth a pound of cure. 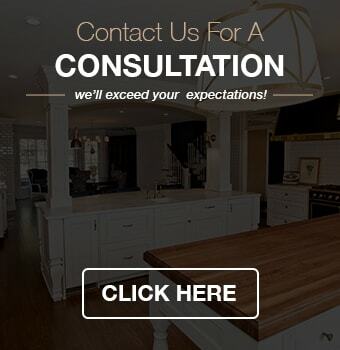 One of your first steps should be to schedule your free consultation with one of our basement finishing contractors. We’ll be able to examine your basement to determine how much work is needed to achieve your plans for the space. Our basement remodeling contractors do all the work of researching local building permits and building codes so you can have peace of mind. If your basement walls are just bare concrete, we’ll need to install insulation, frame walls, and install drywall. As a finished basement company, you’ll find that we’re dedicated to doing quality work and making sure your new living space is welcoming. Once we’re done finishing basement walls, your basement will look much more warmer and inviting. Do you have a concrete floor in your basement? If so, we’ll need to finish your basement floor. During the planning phase of basement remodeling, we’ll ask you to pick a floor covering. Some of the most popular basement flooring options include vinyl and ceramic tile. As a finished basement company, we do everything we can to keep your new flooring protected from moisture. Once we’ve finished the basement walls and floor, we’ll be ready to move onto the ceiling. As a homeowner, you’ll be able to choose between a drop-ceiling and a drywall ceiling to hide pipes and utilities. While a drop-ceiling is less expensive, a drywall ceiling looks more finished. Which ceiling you choose will depend on your budget and personal preference. Now that your basement is finished, you’ll be able to enjoy your new living space. Many people use their finished basements for family rooms, play rooms, home theaters, home offices, exercise rooms, and more. Our remodeling contractors are ready to help you reclaim your basement. Kastler Construction is a finished basement company in Oakland County. To request a free consultation for basement finishing, call (248) 655-5580.